Use drop by the spoonful on ungreased cookie sheet. I made a couple sizes. If you use a heaping TBS it’ll make about 20 shells but we kind of liked the smaller ones I made with a tsp of batter (use parchment paper if you have it, I didn’t and it worked fine, if you spray the pan they’re more likely to burn) . 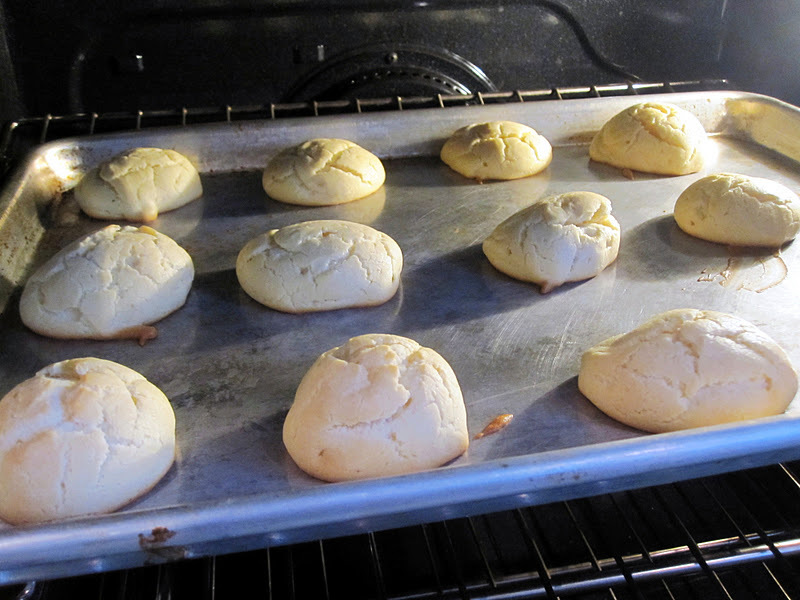 Bake for 20 minutes then poke each in the side with a tooth pick and bake 5 or so minutes more until golden brown. 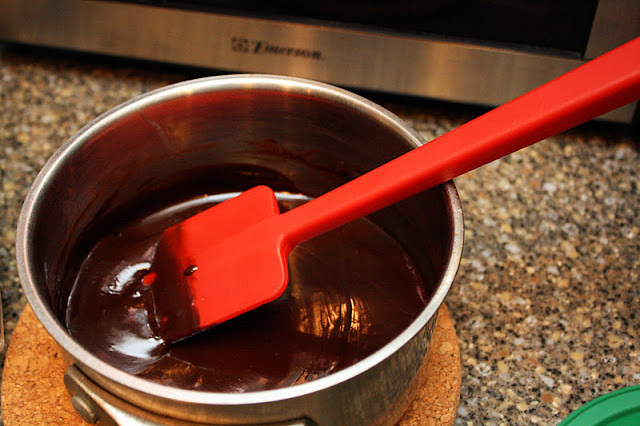 Over medium heat combine chocolate and cream stirring until chocolate is fully melted. Turn off heat and stir in vanilla. When puffs are cool cut a slit or if you like cut off the top part of the puff then put it back on the ice cream like a lil’ hat. 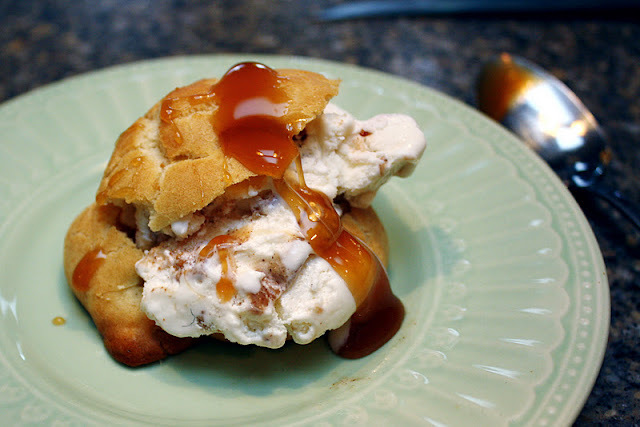 Add a scoop of ice cream and top with ganache or caramel. I used Tillamook ice cream (the yummiest in the world). I did some with their cherry flavor and topped it with the ganache others I used their cinnamon roll flavor with jarred caramel ice cream topping. Oh and an added bonus you can totally make the shells and ganache ahead of time (and supposedly you can freeze the shells) convenient right? That is not something I need to be looking at!!! Now I really want to try it and really need to stay away from sweets for the rest of my life. But what the heck, you only live once. This looks yummy, especially with some homemade ice cream. This looks pretty easy and so delicious! Might have to try these!! 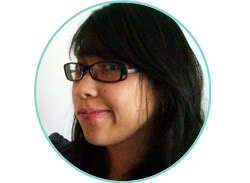 I’m also a new follower to your site! OMG, these look ridiculously delicious!!! YUMMY!!! Those look so yummy and adorable! What an excellent dessert! I never need any convincing about profiteroles – and yours look so delicious and mouth watering. Luscious! The pictures are gorgeous too. Like a magazine! Link up, girl!! 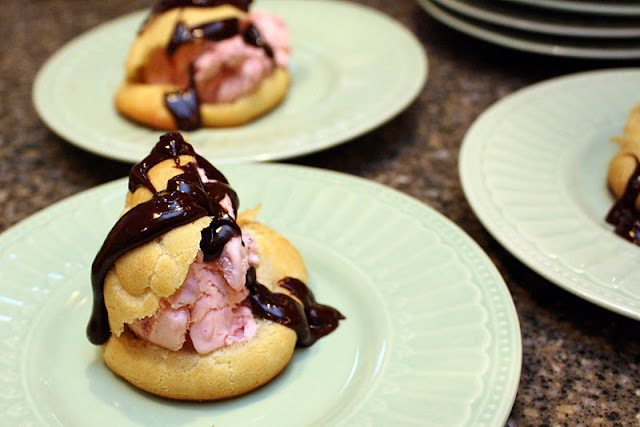 These look amazing.. and of course sooo decadent! Can’t wait to try them.. thanks so much for sharing with the Pink Hippo party! YUM!! You should post these on foodgawker! These look delicious! 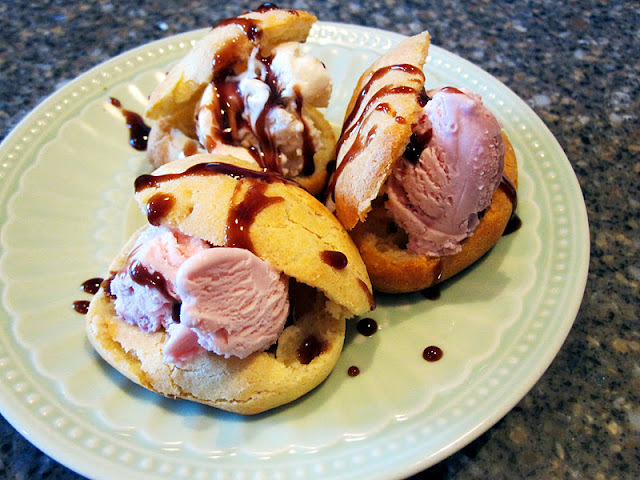 I made cream puffs years ago but never even thought to put ice cream in the middle, great idea! These look divine! In fact, I would like one right now. Glad you shared it. These look so yummy!!!!! I am definitely going to have to try them. Found you on Show & Share. These are to die for! Thanks for lining it up to my linky party! Oh my yummy goodness!!!! These look divine! Stopping over from Yesterday on Tuesday linky party and I’m so glad I did! These look so, so good. I linked to you from Show Off Your Stuff Party. I will be trying these soon. Thank you! Looks Ahhhmazing! I can’t wait to make these, my husband will be in heaven! This post makes me wish I had some of these with my coffee this morning. Yum! A few blog friends and I introduced a new challenge idea Monday and it would be so fun if you want to join. If you have a second, check in at http://thespacebetweenblog.wordpress.com/2012/01/09/imagine-the-impossibilities-challenge/ to learn more, and feel free to email me if you have any questions! Your newest follower. My hubs is drooling over these right now as I have no desserts of any kind in the house to feed him. They look just divine. Thanks for showing off your fabulous work at D2F today, Marissa! You made me hungry! Found you via Tatertots and Jello link up! Wait a minute. You are crafty, can sew and can bake. I’m in awe. Thanks so much for sharing on Momtrends for Friday Food. These look fabulous! I’m always looking for something new to do with my bag of flour. Thanks! Marissa, oh my goodness. These look so good. 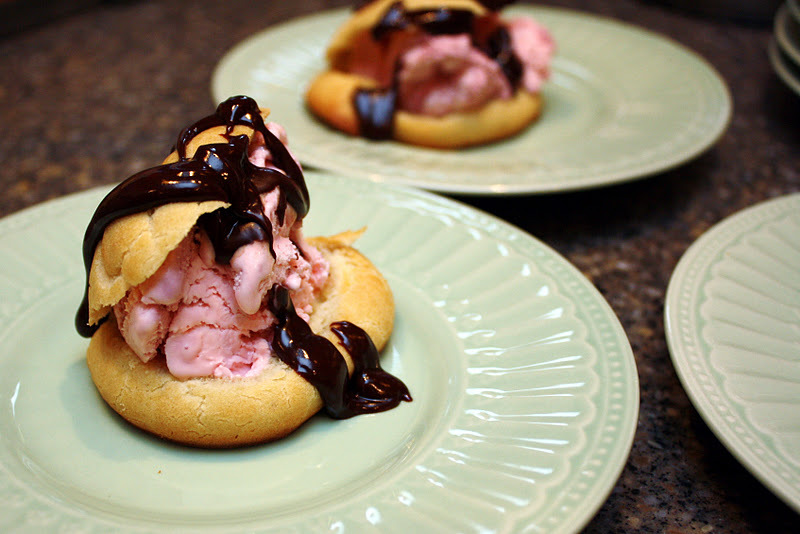 Just the perfect dessert for one of our hot summer nights. Just wanted to thank you for linking up on my Thriving on Thursdays linky party last week. It’s on again tomorrow (Thursday Australian time) and we’d love to see what you’ve been up to. YUM!! Easy and so fancy…LOVE IT! Thanks for linking up at DIY Thrifty Thursday on http://www.thrifty101.blogspot.com. Stop by and grab an “I was featured” button and we hope to see you again this week! Oh, man these look delicious. Just pinned so I’ll remember to try them.